When I left McKinsey to start my own company, a number of my McKinsey friends left to do the same. My two back-to-back startup attempts failed. A number of my McKinsey friends’ startups succeeded, in some cases wildly so (one of them was StubHub). For the first time in my career (and actually life), I failed miserably. I worked until 5am every day, slept 3 hours and got back to work again by 8am. I lived off my wife’s income, while eating canned vegetables for dinner because we couldn’t afford the fresh variety. I maxed out 20 Gold Visa credit cards (I had to buy a special wallet to house them all), and was massively in debt. At one point, I was sleeping on the floor of my mother-in-law’s apartment, and her dog kept going potty next to my head while I was asleep, so I’d wake up with a fragrant surprise. After all that, I had failed, not once but twice. Yes, I had hit rock bottom. I suffered from a moderate case of depression and an extreme case of self-doubt. At the time, I wondered: what the hell did I do wrong? While I did a post-mortem analysis of my strategic and tactical errors, I sensed that there was some other factor at play that I wasn’t grasping. I just couldn’t figure out what it was at the time. Years later, I realized that the missing X factor was relationships. At the time, I had a lone ranger mentality – I was going to do it alone, work hard, and succeed. This works fine in school, but as you get further into the real world, relationships matter. In school, when you harness the talents, skills, and resources of other people, they call it cheating. In life, they call it "using your network." People who did this in school were called cheaters. In life, they’re called "connected." I didn’t appreciate that the rules of the “game” changed once school ended. Looking back, I realized those other startups that succeeded did so in large part due to… relationships. They knew people, who know people, who helped them succeed. They had connections to venture capitalists, super-star developers, salespeople, etc… I had a high IQ and no Rolodex. I definitely chose the hard road. While I realized relationships were the missing X factor, I didn’t do anything about it until about two years ago. That’s when I heard Porter Gale, former Vice President of Marketing for Virgin America Airways, give a speech on how your network (of relationships) was your net worth. She also described networking not as the manipulative scheming I associated it with, but as a way to “build relationships” by being yourself and being generous to others. Although I’ve read many of the most popular books on networking, it never felt right for me until I heard Porter speak. In short, she convinced me to give it a try her way. Doing so over the last two years has genuinely changed my life for the better. I have opened myself up to meeting new people, getting to know people I already know at a deeper level, and putting more energy into relationships (both business and personal) than I ever have in any period of my life. I am also at the most successful point in my career and the happiest I’ve ever been -- both by wide margins compared to earlier time periods. Porter got it right. Relationships DO matter. The quality of your life (in all aspects – career, personal, financial, etc…) very much is correlated with the relationships in your life. It took me, a self-professed "numbers guy," quite a long time to appreciate it, but now that I have, I will never go back to going through life and career on my own. It is so much easier and more enjoyable to have people around you in the process. On the career side, I have a network of people I can call on for help. I didn’t have that before. I also have a network of friends who support me in my personal life. So the next time I fail, and those failures are very much a part of life, I feel I’m in a much more emotionally resilient position. I now have people around me who care about me and will help me get back up. There are times when life knocks you down and you feel like staying down. I’ve certainly had my days (okay weeks, actually months) of wallowing in self-pity. Then you look up and you realize there are a few people with their hands extended, waiting to pull you back up. You have no idea what it feels like to see those hands there… when you’re at rock bottom… giving you the courage to get up and try again. For most of my life, I didn’t know what that felt like. But I do now, and that all happened in the last two years. Both types of relationships (career and personal) are priceless. One type of relationship I’ve been investing a lot of energy into lately has been the relationship I have with you, my readers. I’m going to do both right now as a transparent demonstration. You see after I heard Porter speak, I was so impressed that I went up to her to introduce myself. I doubt she remembered who I was at the time. But we stayed in touch online and about a year ago, I discovered she was turning her speech, the one that changed my life, into a book. She answered that she was trying to reach a broader audience to share her unique approach to networking. At the same time, I’ve received hundreds of emails from you and my other readers asking me for help on how to be more effective networkers. It occurred to me that there would be a good fit for one part of my network to be exposed to another part. So I am going to help out Porter by helping her reach a larger audience (in this case, you). I’m going to help you out by introducing you to Porter’s unique and extremely accessible approach to building relationships. I asked Porter if she wouldn’t mind writing about her thoughts on networking as it applies to current and aspiring management consultants. She graciously agreed to do so. Even for me, in the past, the thought of entering a party and striking up a conversation with a stranger caused me great anxiety. However, somewhere along the way, connecting with people that shared my values and interests changed my life. A couple of years ago, I woke up and was overwhelmed by how full my life had become. My career and social life were rich and my feelings of happiness were at an all time high. I sat in gratitude and realized my success wasn’t just because of hard work – much of it was directly correlated to the people in my life and in my network. Either by fate or design, around the same time an associate asked me to make a presentation about social media at a conference he was hosting. I sat at my desk and tried to put pen to paper. An hour later, I called the host, “I love social media, but I’d like to talk about the power of connections and giving back.” “The topic sounds interesting, I can’t wait to hear what you have to say,” he responded. With life imitating my presentation, that day I met a literary agent that believed in my concepts, and I met Victor Cheng who has been providing valuable guidance and support ever since. With the support of friends like Victor, I wrote a book called Your Network Is Your Net Worth so I could share my ideas with others. It’s a book about breaking down barriers, finding your passions and being the best you can be. It’s a book about connecting and recognizing the power and true value of our relationships. If you are one of the millions who are aspiring to do better— in work or relationships— it’s a book I wrote for you. It’s a storybook and a primer that I hope will help you find greater happiness, success and true wealth. Since you’re a friend of Victor’s, and he’s been an invaluable contact in my network, I’m thrilled to share three of my core ideas with you. 1. Approach networking as transformational, not transactional. If you remember one concept regarding my approach to networking, remember this: networking should not be viewed as a series of transactions. The old way to network involved climbing a ladder for individual benefit. The past was about competition, pursuit of materialism and “keeping up with the Joneses.” In today’s model, networking is transformational or an inside game first. What I mean is that you first must identify any barriers (e.g. negative thinking, fear of public speaking) standing in your way from connecting, and define your values, interests and core purpose. Once you’ve identified any barriers (more about that in my book), you can focus your efforts on meeting people that share your passions, and your networking should feel conversational and not awkward or confrontational. For example, Victor shared with me that when he connects with people based on his core passions of business, entrepreneurship or parenthood, conversations come easily and his networking efforts do not feel strained or uncomfortable. In one email he wrote to me, he said, “I could talk about any of those three (topics) all day long and I genuinely find people with shared interests very interesting. I find networking around other topics to me feels like I'm faking it, so I don't do it. Networking based on values and passions is not only more natural, I also believe that seeking out and working in collaboration with others who share your interests can be the basis for building a strong network foundation, enabling you to reach a higher level of success than you would on your own. Time and time again, I can track much of my success or career opportunities back to collaboration with or tips from contacts within my network. For example, during a fiscal recession I found myself holding a pink slip when the advertising agency I worked for shut its doors. Within several months, I had a call from a past co-worker that a start-up airline called Virgin America was looking for a Vice President of Marketing. My contact wasn’t interested in the job, but he thought the opportunity sounded like a fit for me. After several interviews, and many reference checks with contacts in my network, I was offered the position that ultimately changed the course of my career. 2. Define your passions and purpose with the Funnel Test. Over the years, I’ve worked with many companies and found the ones with lucid and succinctly described visions are more likely to succeed than those with unclear or highly complex visions. Some companies spend hundreds of thousands of dollars defining their brand positioning, core values and vision. Yet as individuals, we often don’t take the time to clearly articulate our own passions or purpose. Imagine that you have five floors of elevator stops and you need to convince someone to hire you while you ride up together. Or you are given three minutes on a stage in front of your peers and you have to describe your personal mission. What would you say? How would you create a memorable connection? To help you define your passions and purpose, I’ve created a simple test that I call "The Funnel Test." Step 1 is to define your three greatest passions, or a succinct set of words that clearly define your core interests. You can put a high priority on any type of passion, from family to fitness or education to the environment. For example, I watched my mother build a network based on her passions of volunteering, family, and fitness when, after having lived her entire life in Minnesota, she moved to California to be closer to her family. Within sixty days of arriving, my mother joined a master’s swim team, found a group of women who played tennis at the park, and became an alternate in a golf foursome. When she added in volunteering for a single-mothers group, her daily activities and calendar entries rivaled mine. 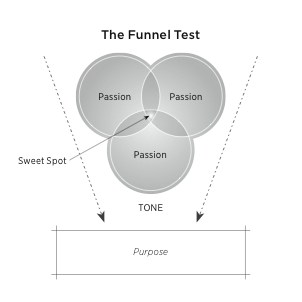 The area where your three passions overlap is your sweet spot. If you can find activities, work, or relationships that combine two or more of your core passions, you are likely to hit the jackpot and be more effective in and excited about your actions and activities. Step 2 is to define your desired tone. How do you want to present yourself to the world? What is your authentic voice? Are you quiet and reserved? Witty? Bold? Irreverent? To use the example of my mom again, I’d define her tone as reserved. She’s understated and is more likely to listen first and talk second. Now fill the space below your passion circles with a selected word for your tone. Like a funnel, where the contents flow from top to bottom, envision all of your actions being influenced by your tone. Remember, simple is good. The last step of The Funnel Test is to define your core purpose in twenty words or less. What do you want to accomplish in life? And work? Write what is in your gut, and look at the passion words in your Funnel Test. Your goal is to write a phrase of fewer than twenty words that describes your purpose. The last concept I’d like to share is about the power of helping others. The phrase I’ve coined to help you remember this idea is “Give Give Get”; that is, put greater energy into giving than receiving. I believe the key to unlocking the hidden power of connections is helping others when you don’t expect anything in return. A focus on giving can transform your emotional state, improve your relationships, build your happiness quotient, and teach you the importance of gratitude. If you put giving back and helping others at the center of your networking and relationship building, you are likely to have more impactful and stronger relationships, among other benefits. What you will find is that the giving will come back to you tenfold. Living “Give Give Get” can be as easy as remembering that small actions can make a big difference or asking your contacts, “How can I help?” Think about the "we," not just the "me" when networking, and you will have greater success. I hope the concepts and stories will help you grow and build your network. With deep thanks and appreciation to Victor, I encourage all of you to think about the value of your connections, your relationships, and your true net worth. What role does your network play in your life? What truly makes you happy? Time and again I’ve found that the people and relationships in my life have a direct impact on my feelings of happiness, the experiences I have, and the business opportunities that land in my path. Remember to look inside first, outside second. If you focus on your passions and reorganize your networking around your values and beliefs, you will discover the kind of lasting relationships, personal transformation, and, ultimately, tangible wealth that are the foundation for happiness and success. Help others, be of service, live each day fully, and remember, Your Network Is Your Net Worth. As you can see, Porter’s approach to networking differs from what most people think of as networking. Having used her approach for two years now, I’ve found it surprisingly easy to build relationships in this way. I enjoy helping others but never really realized that doing so provides the foundation for building long-term relationships. I wish I knew about this years ago. I asked Porter to share her words of wisdom with you so you can learn from my mistakes without having to bear the consequences yourself. I also want to recommend you get a copy of Porter’s new book, aptly titled Your Network is Your Net Worth. As I’ve mentioned to Porter on a few occasions, while I’ve read a lot on networking from other books, her approach is the first and only approach I actually ended up adopting. By nature, I am a shy introvert. At cocktail parties, I try to hide and look busy to avoid feeling awkward. Despite all this, Porter’s approach to networking has been very “doable” for me. I’m not a super networker like some people I know, and that’s okay. I don’t need to be. I just need to continually build relationships as I go, and the rest takes cares of itself. If you’re looking for a long-term career “game changer,” let the book Your Network is Your Net Worth be your guide. It has completely changed my life over the last two years. I hope you will allow it to do the same for you. Impressive… Transformational v. Transactional relations/networking is such an important point. So critical. I’ll be reflecting for some time on this as well as your/Porter Gale’s other points. I know I have some room for improvement and personal development. Thank you for sharing your story. Your Network Is Your Net Worth, that’s a really refreshing and eye-opening idea. I will definitely read this book. Thanks, Victor, for sharing your personal story with us. I’m curious, with an evergrowing network, how do you balance maintaining quality interactions in your existing relationships while also continuing to meet new people? That’s a great article that I saw a while back. I focus on quality vs quantity in part because quality will automatically lead to quantity, but quantity will not lead to quality. A few strong relationships is worth more than a bunch of weaker ones. I have a few relationships that are pret strong with super networkers who know hundreds of people. I’m an introvert and I cant sustain that level of networking as it drains me (for my super networking friends, networking is how they relax). So I just build really strong relationships with the super networkers, and they are happy to introduce me to anyone in their network where the introduction would be mutually beneficial. They key is to be on that person’s strong relationship list. The point is that these are free for you and possibly priceless for the people who receive them. So a win-win proposition. P.S. I’ll connect with you shortly about helping her spread her message through LinkedIn as well. Please expect an email from me. Thank you for sharing this very informative and eye-opener article. Will read this book and apply it to myself. I will also share this with my family and friends. Next: Case Practice for Experienced Hires?